According to news from "Making Waves" Greenpeace weblog, a new flag of this organization is designed by Danielle Brandt of Denmark. More about the flag (as well as photos of old and new flag also) at the website. Now, what was wrong with the old flag (blue one) that it had to be changed? Nothing wrong. Except that "green-coloured" organization has blue flag. This new design is not good idea, in my opinion. Putting the URL on the flag? Have we more examples of that? 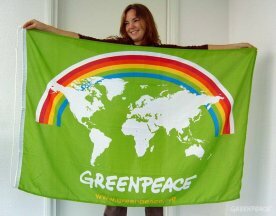 The Greenpeace flag prior to 2007 featured a red-yellow-green-blue rainbow centered on a green field. Across the red and yellow stripes of the rainbow are printed the blue capital letters spelling "GREENPEACE." At the base of the rainbow is a dove in blue and white holding an olive branch in his beak. The URL "www.greenpeace.org" appears in the lower fly of the flag. 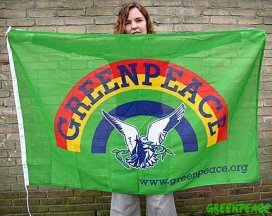 As shown on the organization's Dutch section website, the flag is blue and features a white peace dove above the wording "Greenpeace" in the usual lettering. I just happened to visit a passing Greenpeace ship, going upstream from Samara to Nizhniy Novgorod collecting Volga water samples and engaging in press conferences and information to the public. I confirmed the flag, used not on the ship, but on a rental van used by the crew for ashore action. The Greenpeace pennant shows a rainbow arc: red, yellow, green, blue on green. In a TV miniseries I just saw, a Greenpeace ship flew a simple white flag with the word "Greenpeace" in the distinctive font (green, naturally). It was shown on the movie Rainbow Warrior last night on national TV in Croatia, I was asked by several people about the flag seen there in final sceenes. I have not seen the movie, but the flag was described to be as white, with black peace sign encirceled in the rainbow colours. What's that flag, and what flag was used really on the ship? Based on the description by Željko (xf-film.html#rainbow) and existing Rainbow Peace flags, I've made the above speculative image of the flag reported to him near the end of the documentary feature Rainbow Warror.